This Sacramento, California native caught Leipzig's attention as a member of FC Dallas’ youth academy, and signed on at the club in summer 2017. Although Brewer has struggled for minutes in Germany, he scored his first goal for the club straight after being subbed on in a match against Osnabrück's U19s. Taitague joined Schalke’s academy in February 2017. Even though we was only 17 at the time, he was placed in the U19 squad alongside his compatriot McKennie. This season, the Virginia native has become an integral part of his team’s system, contributing two goals and five assists as an undisputed starter. Back issues have kept this young American off the field since November, but it’s clear that the Royal Blues trust his potential, and a timely comeback could open the path for a late-season first team debut -just like McKennie last year. Before McKennie and Taitague made their way to Gelsenkirchen, a 6'4" towering Californian was already waving the U.S. flag for the Royal Blues. Wright joined Schalke in April 2016 and had not even recovered from jetlag before scoring a brace on his debut for the U19s. The following season, he impressed everyone with 12 goals and 12 assists, leading the way for a top four finish in the U19 Bundesliga. In the summer of 2017 he was loaned out to Bundesliga 2 side SV Sandhausen, where he scored on debut yet again. Although getting minutes ahead of his more experienced team-mates is proving difficult for Wright, he is gaining valuable professional experience that gives him an edge over other youth prospects, and has already made 12 second-division outings for Sandhausen, scoring once. This striker born in Berlin, New Jersey arrived in February 2017 to reinforce Werder Bremen’s U19 side and immediately made an impact for the junior Green-Whites with three goals and six assists in 11 games. Since Young was no longer eligible for their academy side this season, Werder decided to keep him close to base in their reserves, as opposed to loaning him out. 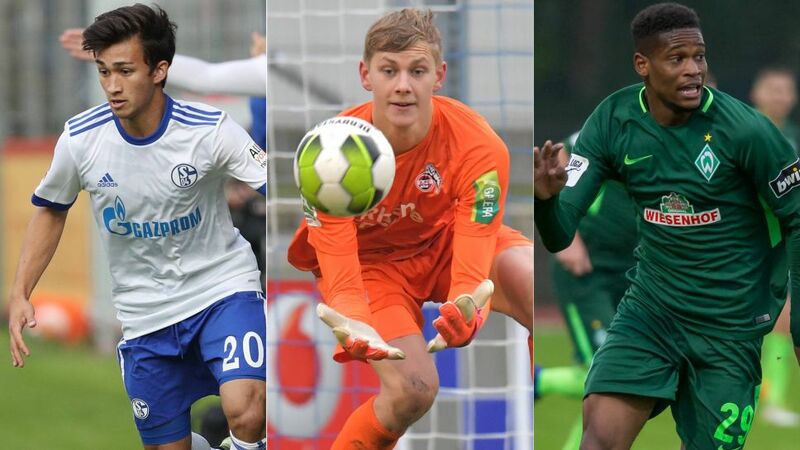 Bremen have the highest-placed reserve squad in Germany - the only one in the third division- so their talented youngster is also gaining valuable experience that most players in his position are not exposed to. While Hertha Berlin’s Jonathan Klinsmann looks like a natural long-term contender to be the USMNT’s first-choice custodian, one of his closest competitors is also developing his skills in the Bundesliga. California native Brady Scott signed for Cologne in the summer of 2017 and has been busy adapting to his new life in Germany. Although he’s officially part of the reserves team roster, where he’s currently the second choice behind 28-year-old Sven Bacher, Scott has already sampled the atmosphere of the first team at first hand. Upon arrival, he travelled to their preseason training camp in Austria and was even part of the squad in the first round of the DFB Cup against Leher TS. The Billy Goats have one of the most exciting - and unusual - prospects in U.S. soccer in their academy. Perry’s case is particular as he was born in New York but grew up in Sweden and blossomed as a footballer with AIK Solna, with whom he even played in this year’s UEFA Europa League. After playing for the U.S. U18s in 2016, he went back to play for Sweden in mid 2017, only to finally settle for the Stars and Stripes in late 2017. Through trials and tribulations, his allegiance to the USMNT is now set in stone and the Bundesliga could prove to be the fertile soil for yet another American world-beater.